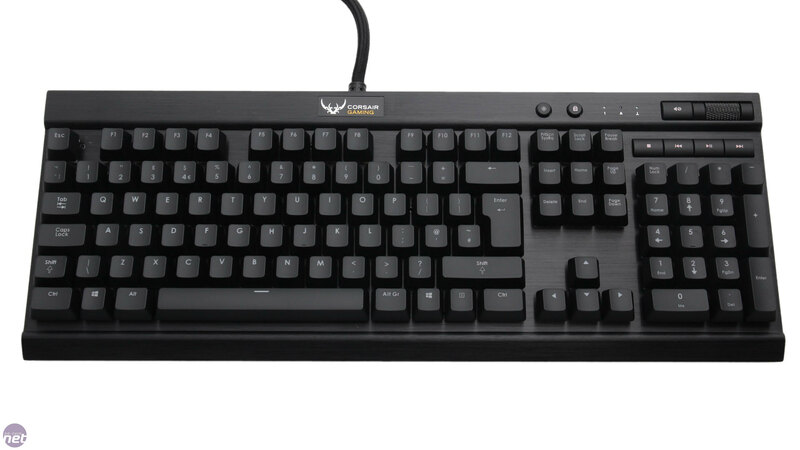 The past decade has seen Corsair enter numerous enthusiast markets, usually with a fair amount of success too. In recognition of this change, Corsair is today launching a brand new division of its company to be called Corsair Gaming, which from now on will be the brand that encompasses its high end performance peripherals and accessories. 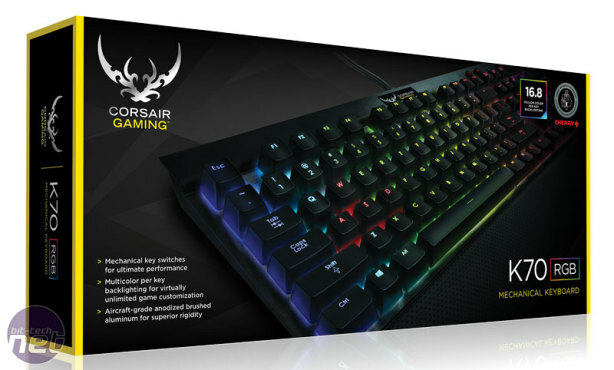 These include the newly launched line of RGB peripherals; the Corsair Gaming K70 RGB, Corsair Gaming K95 RGB and Corsair Gaming M65 RGB. You can also expect to see some mouse mats and a pair of headsets launched under the new moniker in the coming weeks. The launch of this new division makes a lot of sense given the size of the PC gaming and eSports markets, which have never been bigger. Corsair Gaming will have a heavy focus on community, and not just with their customers through forums. 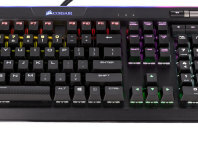 You can expect to see heavy exposure of the brand at gaming events and sponsorship of eSports teams, and Corsair Gaming will also be supporting game developers with equipment and SDKs and working with them to integrate support for their latest peripherals into the latest games. 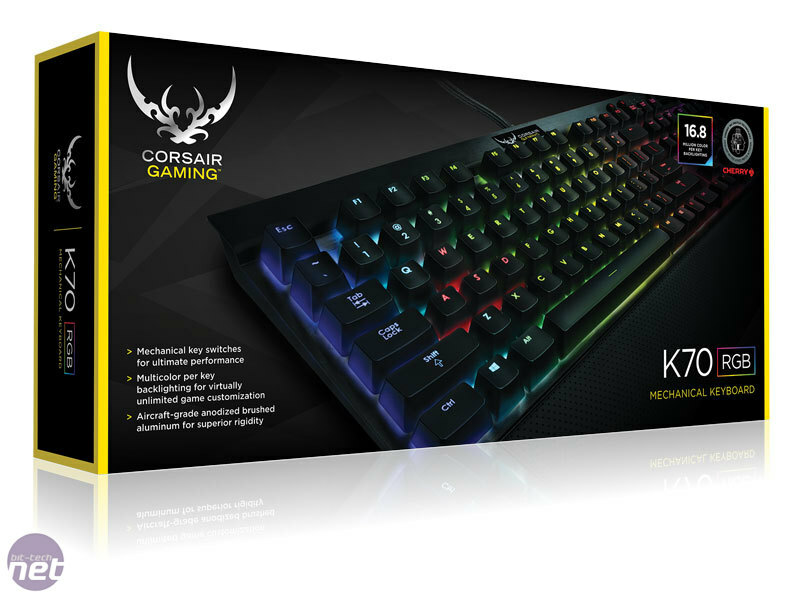 The K70 RGB is one of the launch day products for Corsair Gaming. It's been a very long time coming for this product; working demo units were showcased way back at CES 2014. Regardless, it's here now and it's here to stay. 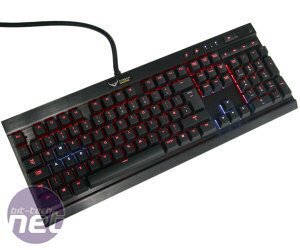 As you can see, it looks virtually identical to the original Corsair Vengeance K70, other than the branding change, but the main new feature is hidden beneath the keycaps – Cherry MX RGB mechanical switches. 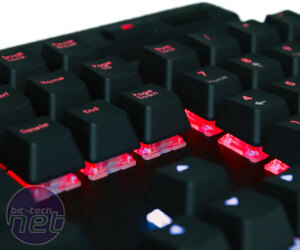 We'll look at these closely in a moment, but they enable something no other mechanical keyboard has, which is per-key programmable RGB backlighting. That said, Razer will very soon be launching its Chroma keyboard, also for £140, with the same feature, but that keyboard does not use Cherry MX switches. 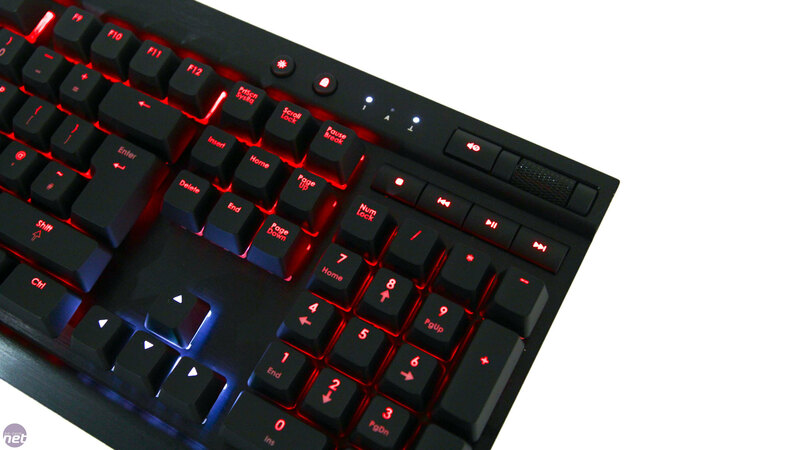 It's not only lighting functionality that's changed either, as the K70 RGB now allows users to re-map the functionality of all the standard keys, including the ability to use pre-programmed macros. Since the design and layout of the K70 RGB is the same as the K70, we don't need to go into too much detail here and repeat ourselves. Suffice it to say that it's as good as ever – the anodised brushed aluminium plate looks fantastic and makes the K70 RGB exceptionally rigid. The raised, laser-etched keycaps are comfortable to work with and also look good as well as making the keyboard easy to clean. 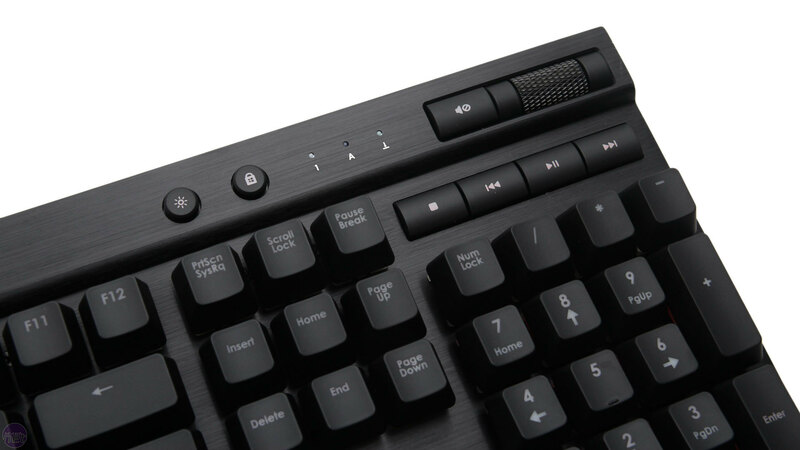 The low profile media keys are well positioned too, and we particularly like the metal volume wheel. Finally, front and hind legs and a detachable wrist rest with a soft touch, perforated finish ensure you have good control of how the keyboard sits on your desk. Other features include dedicated brightness and Windows lock buttons; the programmable backlighting button has disappeared since this is now all controlled through software. There's also a slider to change the current USB polling rate (up to 1,000Hz) and to place the keyboard into legacy BIOS mode for compatibility with older motherboards. Sadly, one feature that's been cut is the USB pass-through port. Admittedly, it was only ever a USB 2 port, but it did have its uses. It is likely a result of the keyboards increased power requirements which are brought about by the new processor and lighting controller. After all, the keyboard still requires two USB connections despite the absence of a pass-through port. The two USB plugs are found at the end of a thick 2 metre cable with a high quality braiding. 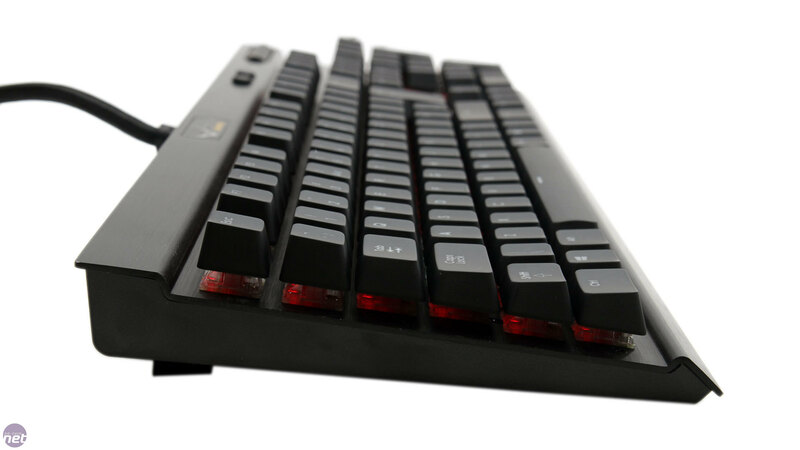 The Cherry MX RGB switch makes its début in this keyboard. 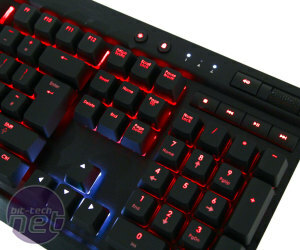 Corsair Gaming has a limited time exclusivity deal with Cherry for the use of these switches until the end of the year, though we expect the company also has enough orders placed for the new year that it will be difficult for competitors to obtain large quantities, at least in the initial months after the deal expires. 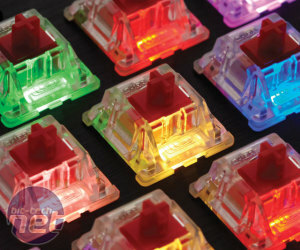 Current Cherry MX switches have space for a single 3mm LED to be mounted directly on the switch. 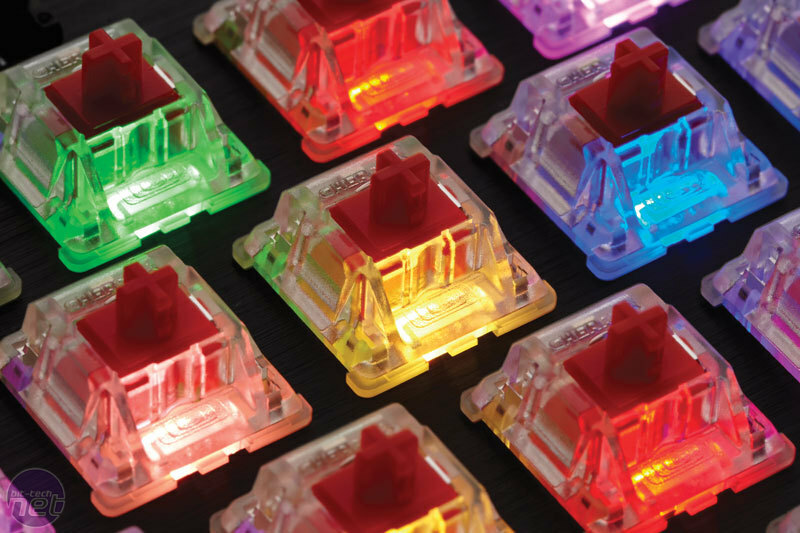 However, the minimum size for an RGB LED is 5mm, so Corsair and Cherry worked together to develop a new switch that could support this larger LED type without compromising at all on the feel, reliability and range of the existing switches. After all, it is these characteristics that define Cherry MX switches, so changing them was not an option. The main change made to achieve this was the use of a surface mounted LED on the PCB of the switch itself. A precisely designed lens was then placed where the original LED used to be, to mimic its lighting effects. The surface mounted LED also has higher reliability, as it reduces the chances of electrostatic discharge which is the leading cause of LED failures. Cherry MX RGB switches are still rated for 50 million key presses and come with red, blue and brown options. One final feature worth noting is the 100 percent anti-ghosting as a result of the keyboard's full key rollover. Corsair wants to emphasise that this is true full key rollover and that this is entirely possible and functional over USB. 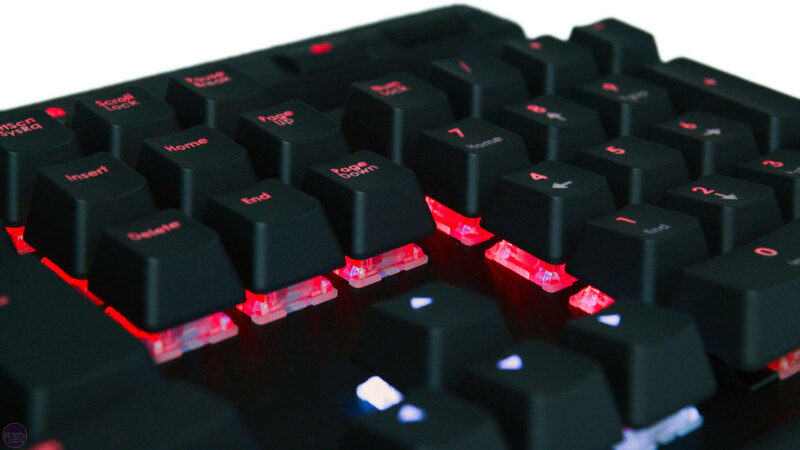 The benefit of it is mainly for users who re-map keys, as usually anti-ghosting matrices are designed around key gaming areas (WASD, for example) as these are the areas where most users will be pressing multiple keys at once. However, anyone who re-maps standard controls to custom ones may find that certain combinations no longer register every key press, but this need never be a concern on the K70 RGB. 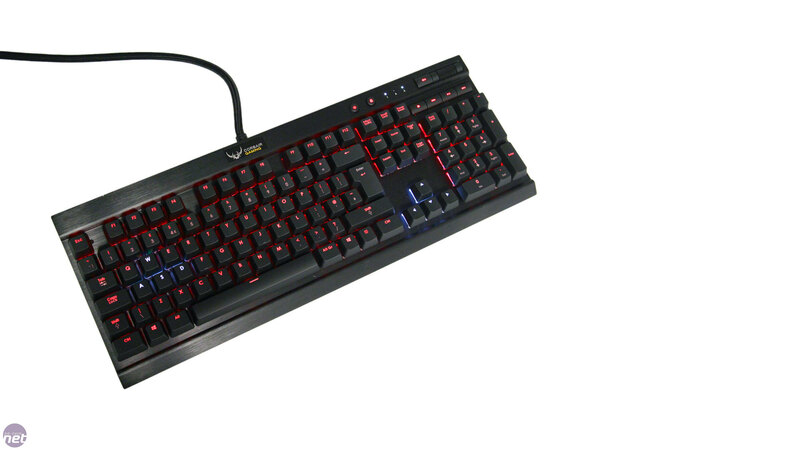 Possibly the most feature-packed keyboard out there, the K95 RGB Platinum has it all.